Smiths’ bar + café (ground floor), cocktail bar (1st), grill (2nd) and restaurant and terrace (3rd) have a busy but spacious home in a recently refurbished Grade II listed warehouse sprawling from 67 to 77 Charterhouse Street opposite the main Smithfield meat market on the north side. 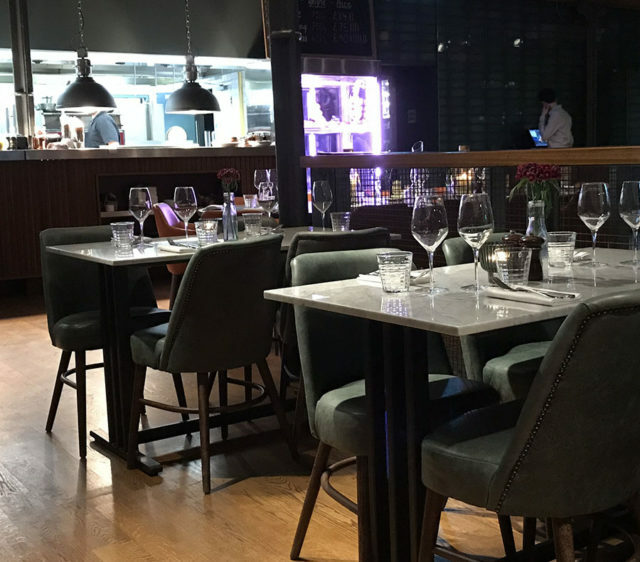 The long established restaurant complex was acquired by Youngs a year ago and has since undergone some extensive refurbishment and menu changes. This is a massive venue with huge open plan rooms (which makes it feel spacious) and each floor has a different flavour, whether you are meeting a friend for coffee, a business colleague for lunch, or you are searching for a more classy venue with award-winning cuisine. Very few destinations close by can satisfy all of those requirements in the same building. This evening, we were heading for the Grill restaurant on the 2nd floor. 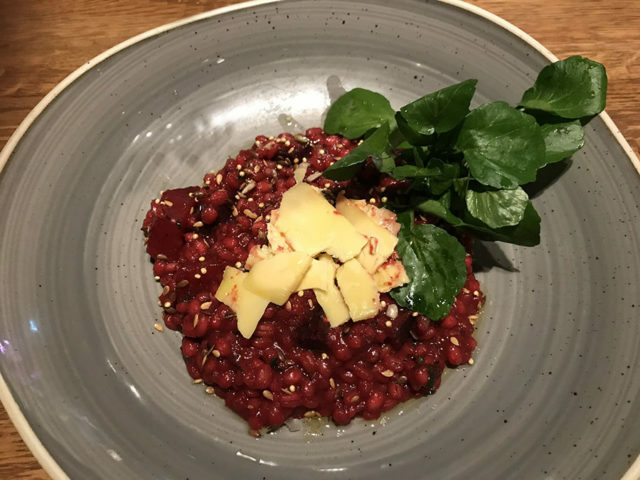 We reviewed this restaurant 18 months ago and were back after the refurb since Youngs took over. To be honest, I couldn’t work out what needed to be refurbished; it seemed to have the ‘industrial warehouse’ style off pat on our last visit, but after comparing the photos now to the photos then, there are subtle but clever differences which are an improvement: most noticeably the much more comfortable seating and brand new tables. As expected, there is also an appetising new menu too, and a robust wine list with advice on selection for a novice like me. Wines are a good mix of New World and European ranging in price from around £26 upwards, including some fine wines with fairly hefty price tags. A few of the wines are available by the glass which can keep the costs down for the relatively light drinker. The Grill is obviously expert in steaks so I wanted to choose that for a main course, but there was a vegetarian and vegan option, for main, which looked so tempting that I asked if I could have one of them as a starter portion. The chef was very obliging and rustled me up a starter portion of the pearl barley risotto. I absolutely love tasting the creativity in vegan recipes; it is so true that a good chef can turn even the most readily available ingredients into a delicious dish. I wouldn’t even attempt to create something like this at home and so it was such a treat to choose it here. My partner chose the scallops to start. 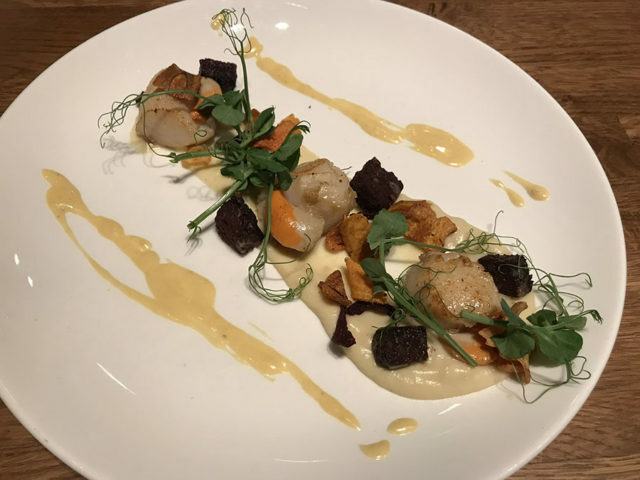 Presentation was a work of art and the scallops were prepared perfectly: the sweet and delicate flavour of the shellfish paired with the spicy textured black pudding combines into a scrumptious nod to the Smithfield market! For mains, we resisted the game pie (saved that for another time) and chose the fillet steak and hake. Spending a lot of time in South Africa, I am a bit of a fillet connoisseur and this portion and preparation was up there with the best fillets I’ve had anywhere. Not cheap (fillets never are in London, these days), but thick, succulent, tender and faultlessly delicious, I hope every fillet is as good as this one in the future. The chips were thick and chunky and well-cooked and I chose the optional Chimichurri sauce because I had no idea what it was. Originating from Argentina and Uruguay, it is an uncooked mixture of fresh herbs, garlic, vinegar, olive oil, and spicy jalapeno pepper. It tasted full of flavour and fresh as a daisy but, to be brutally honest, I wasn’t that keen. That, however, is just my personal taste, and since it came separately in a cute little pot, I just left it. I didn’t make a big deal of it, but the waiter noticed, anyway, and offered to give me an alternative; you have to admire that kind of service. 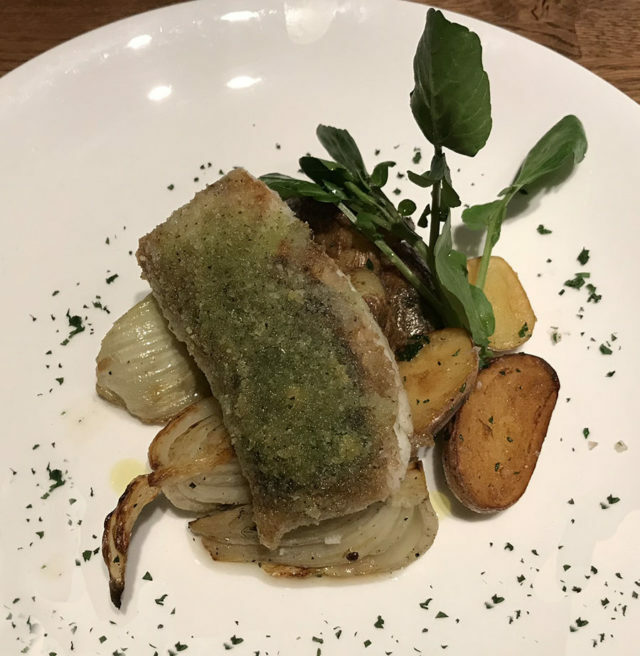 The hake was prepared and presented beautifully with a crust full of flavour and texture. The dish comes with perfect potatoes and you might think you have to order some green somethings to bulk up your vitamins, but fennel packs a fair nutritional punch so this is a meal in one. 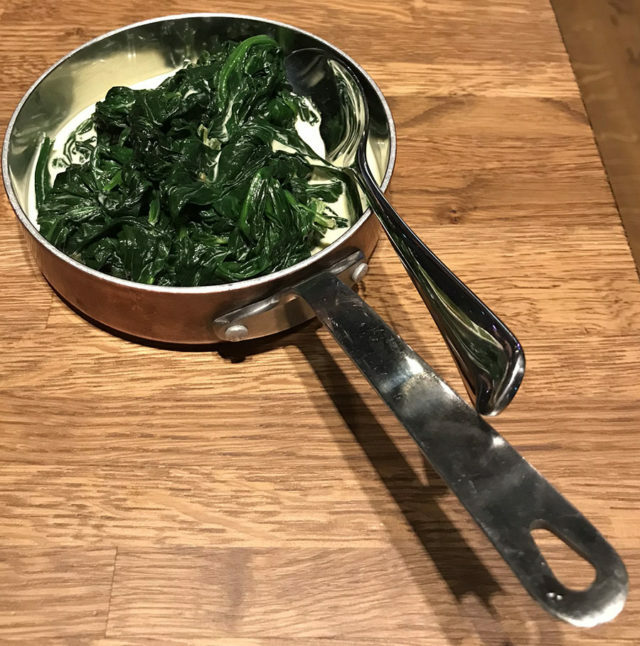 We did have a side of fresh (and just the right amount of fibrous) creamed spinach because I love spinach and I wouldn’t feel morally open to pudding unless I’d finished my veg! For dessert, the choice was agony because there were so many favourites. I called on the waiter and he recommended the sticky toffee pudding or the apple and blacberry pudding, so I took over and ordered one of each for us, instead of the cheese my partner normally elects; needs must when a crisis such as this arises. 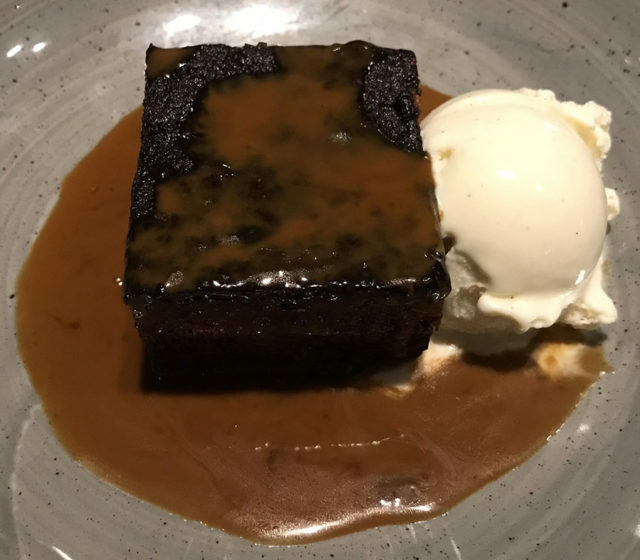 The sticky toffee pudding was heavenly and there was no shortage of sauce which I would have licked off the plate if I hadn’t been out in public. 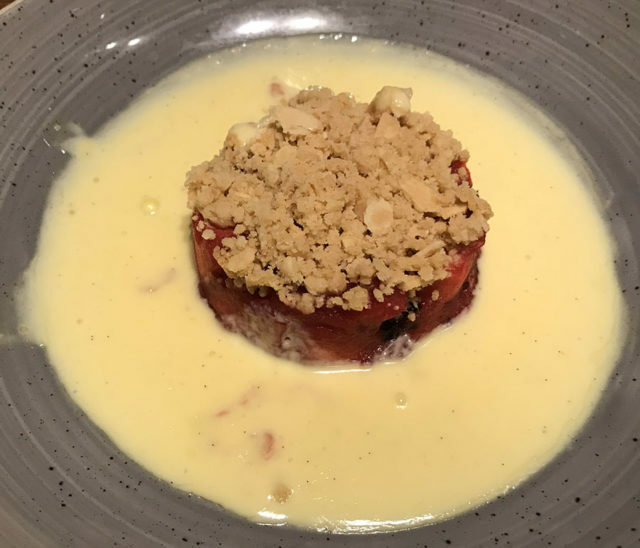 It was tough not to commandeer the apple and blackberry pudding, too, because it had hidden its true unique selling point in its title: it was actually a crumble (another one of my favourites) with the most marvellous ratio of fruit to crumble. To be fair, you could have shared either one of these desserts because the portions are definitely not stingy. I’d love to have that kind of willpower. 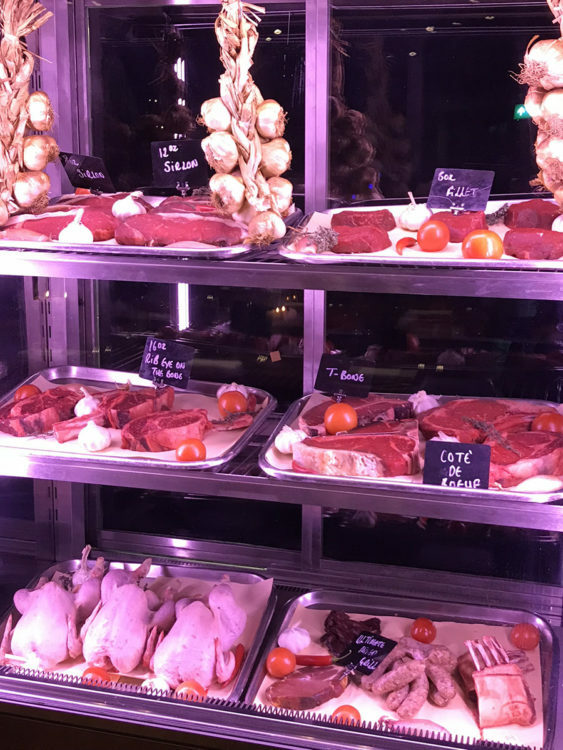 Respect for steak is everywhere here and I have no worries, even with the market move on the horizon, that Smiths have such a strong relationships with their suppliers (for the purpose of provenance) that we won’t suffer. You can choose cuts from the chilled display cabinet next to the half-open kitchen. 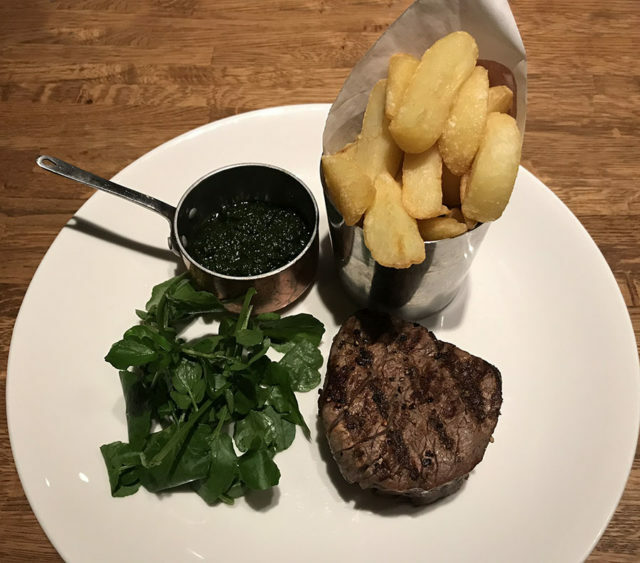 In summary, the Grill serves excellent British steaks and a great choice of other main courses varying in price from very reasonable to ‘treat’ so it can suit all purses, it is only a stone’s throw away. 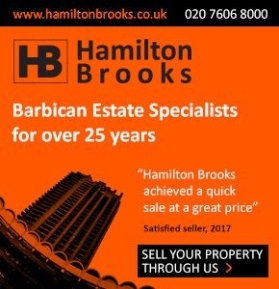 At times it has offered a discount to Barbican Association members, but not at the moment under the new management.